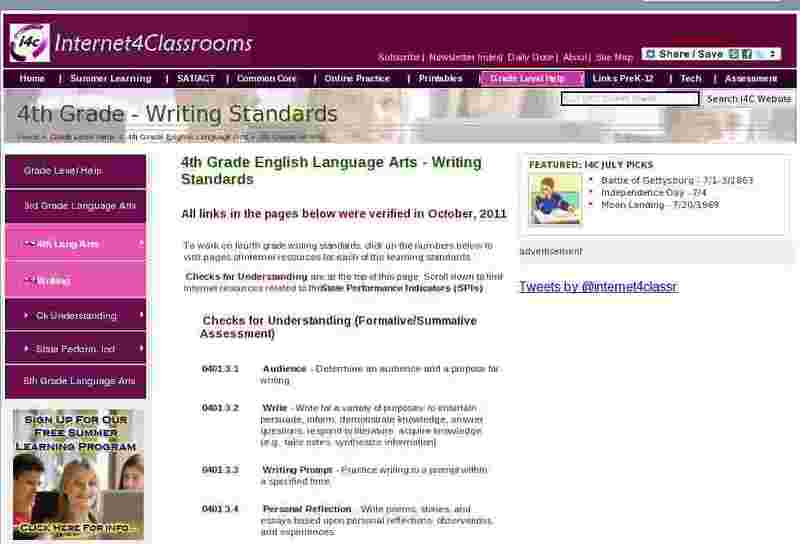 To work on fourth grade writing standards, click on the numbers below to visit pages of internet resources for each of the learning standards. 0401.3.1 Audience - Determine an audience and a purpose for writing. 0401.3.2 Write - Write for a variety of purposes: to entertain, persuade, inform, demonstrate knowledge, answer questions, respond to literature, acquire knowledge (e.g., take notes, synthesize information). 0401.3.3 Writing Prompt - Practice writing to a prompt within a specified time. 0401.3.4 Personal Reflection - Write poems, stories, and essays based upon personal reflections, observations, and experiences. 0401.3.5 Write Letters - Write friendly and business letters. 0401.3.6 Compare - Compare in writing two persons or things. 0401.3.7 Original Response - Write creative, imaginative, and original responses to literature (e.g., poems, raps, stories). 0401.3.8 Writing Process - Use all steps in the writing process: brainstorm and organize ideas, create a first draft, revise and proofread draft, share completed work. 0401.3.9 Graphic Organizer - Arrange ideas by using graphic organizers (e.g., listing clustering, story maps, webs). 0401.3.10 Refine a Topic - Select and refine a topic. 0401.3.11 Topic Sentence - Develop a topic sentence with supporting details and a concluding sentence to form a paragraph. 0401.3.12 Varied Sentences - Construct varied sentences (i.e., syntactic variety) to add interest. 0401.3.13 Logical Order - Arrange multi-paragraph work in a logical and coherent order. 0401.3.14 Transitional Words - Use appropriate time-order or transitional words. 0401.3.15 Vivid Language - Incorporate vivid language into writing. 0401.3.16 Page Format - Use correct page format (e.g., paragraphs, margins, indentations, titles). 0401.3.17 Revise - Revise to clarify and refine ideas, to distinguish among important, unimportant, and irrelevant information, and to enhance word selection. 0401.3.18 Use Resources - Use resources (e.g., dictionary, thesaurus, computer) to aid in the writing process. 0401.3.19 Rubric - Develop and use a classroom rubric for written work and use for peer review and editing. 0401.3.20 Use Technology - Use technology to publish and present. 0401.3.21 Publication - Identify and explore opportunities for publication (e.g., local/national contests, Internet web sites, newspapers, periodicals, school displays). SPI 0401.3.1 Purpose - Identify the purpose for writing (i.e., to entertain, to inform, to share experiences) and the audience for which it is intended. SPI 0401.3.2 Identify Audience - Identify the audience for which a text is written. SPI 0401.3.3 Choose Topic - Choose a topic sentence for a paragraph. SPI 0401.3.4 Support Topic - Select details that support a topic sentence. SPI 0401.3.5 Coherent Paragraph - Rearrange sentences to form a sequential, coherent paragraph. SPI 0401.3.6 Supporting Sentence - Choose the supporting sentence that best fits the context and flow of ideas in a paragraph. SPI 0401.3.7 Irrelevant Sentences - Identify sentences irrelevant to a paragraph's theme or flow. SPI 0401.3.8 Time-Order - Select appropriate time-order or transitional words to enhance the flow of a writing sample. SPI 0401.3.9 Appropriate Title - Select an appropriate title that reflects the topic of a written selection. SPI 0401.3.10 Graphic Organizer - Complete a graphic organizer (i.e., clustering, listing, mapping, webbing) to group ideas for writing.